We went to see our pediatrician yesterday, and I couldn’t help but think how lucky we are to have such a fantastic and caring dr. on our side. I use the word lucky because we really did luck up, as we had no clue how to pick a care provider for our lil’ bougie. I read that we should interview doctors beforehand, but what in the heck does one ask in choosing care for a human they’ve never even met?! If you’re like us, the time to pick a doctor probably snuck up on you! Maybe you thought you’d shop around for a pediatrician after the whole birth thing was taken care of. But that would be way too easy! In fact, the second your OB/GYN cuts the umbilical cord, the baby is no longer theirs to care for. 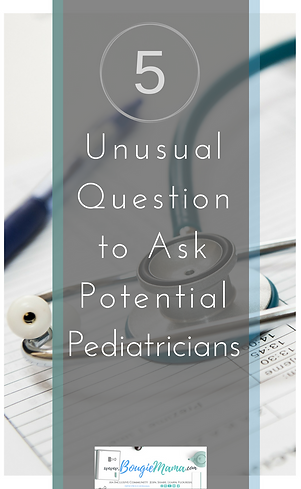 Here’s where the pediatrician selection process becomes important! You’ll need to choose a pediatrician that has rights at your delivery hospital to come check your baby out within 24 hours of their birth! Alternatively, the hospital will have a pediatrician on call at the hospital to check your baby; but beware: they may not be in your insurance network and that will cost you! 1. What is your take on vaccinations and parents choosing to forego them? Our child is following the standard vaccination schedule, but it’s important to know the doctor’s philosophy and opinion. There’s a lot of information you can glean from this answer about the doctor’s knowledge of current research and literature (are they citing the American Academy of Pediatrics, for example). You can also become more aware of what types of other patients you may be waiting within the waiting room. If you’re against vaccines, this is clearly a crucial question as well! 2. What are your thoughts on extended breastfeeding? Extended breastfeeding is defined as breastfeeding (in addition to feeding solid foods) beyond 1-year-old. While the World Health Organization suggests breastfeeding until at least 2 years old (at the time of writing). I’ve heard horror stories of mamas whose doctors have called their extended breastfeeding gross, or attributed lots of negative things to it. It’s important to know where your doctor stands on this, even if you don’t plan on breastfeeding at all. 3. Do you believe that alternative medicinal practices can be healing? Your ideal answer to this question might be different than mine. That’s totally fine. I’ll give you an example of why this can be important. When lil bougie caught an eye infection, my doctor prescribed antibiotic drops. She suggested I use them after trying breastmilk. That’s right: breastmilk has antibiotic properties (it’s loaded with antibodies that fight infection). This was ideal for us. She prescribed medicine, and also suggested a natural remedy as a first line of defense. I’m also confident that if we wanted to implement a treatment based in cultural tradition, she would be receptive and collaborative. 4. Do you take state-funded insurance? Find out if your potential doctor accepts patients who use income-based government insurance plans. Even if you don’t use it, you can never be sure when your circumstances might change. In addition to your own potential financial fragility, your doctor’s acceptance (or lack thereof) will influence the kinds of patients they treat. For me, it is crucial that my doctor see diverse patients because I think it makes her a better, more well-rounded doctor. Research shows that doctors tend to take the pain of African American patients less seriously than White patients. I don’t have research to show that doctors who treat more socioeconomically diverse patients are less likely to hold these biases, but to me it makes sense that exposure to more diverse folks wouldn’t be a bad thing. 5. What after-hour call resources do you offer? It’s crucial to know who you’ll be talking to when your baby does that totally normal baby thing in the middle of the night that sends you running to Google, which then frightens the living daylights out of you, forcing you to call your doctor’s office on the verge of tears. That happens. Find out what type of system your doctor has in place to handle middle of the night emergencies (real or Google-induced). Typically, larger practices might have an advice nurse on call, while smaller practices may direct you to an off-site set of on-call nurses. The second scenario can be problematic if you need to call multiple times for one situation. Each time you call, you may get a different nurse, and have to repeat every symptom every time. My doctor’s office will direct me to either my doctor, or her partner doctor if we need them. I’m not sure how common this is, but it’s definitely my personal preference! At the end of the day, finding a good pediatrician is about finding the right fit for your family. While waiting room times and waiting room amenities can be luring or off-putting, it’s what’s inside the exam room that counts. Do you offer same-day appointments for sick patients? How long are your appointment blocks? What happens if you’re not available unexpectedly? What hospital are you associated with? What do you think of sleep training? What are your opinions on circumcision? Don’t be afraid to ask the questions that matter to you, because this person will play an important role in your child-rearing village.